Kazi Khaleed Ashraf Teaches architecture at the University of Hawai'i at Manoa. His publication include An Architecture of Independence: The Making of Modern South Asia (with James Belluarodo); Sherebanglanagar: Louis kahn and the Making of a Capital Complex (with Saif ul Haque); and the Architectural Design volume Made in India which received the Pierre Vago jourbakusn Award from the International Committee of Architectural Critics (CICA). The Hermit's Hut offers an original insight into the profound relationship between architecture and asceticism. Although architecture continually responds to ascetic compulsions, as in its frequent encounter with the question of excess and less, it is typically considered separate from asceticism. In contrast, this innovative book explores the rich and mutual ways in which asceticism and architecture are played out in each other's practices. The questions of asceticism is also considered – as neither a religious discourse nor a specific cultural tradition but as a perennial issue in the practice of culture. The Hermit's Hut weaves together the fields of architecture, anthropology religion and philosophy to offer multidisciplinary and historical insights. 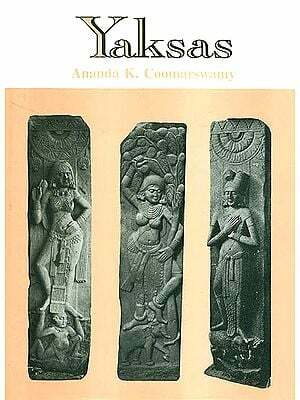 Written in an engaging and accessible manner, it will appeal to readers with diverse interests and in a variety of disciplines whether one is interested in the history of ascetic of "home" in ancient India, or the theme of the body as building. With the declaration " Architect, you shall not build your house again, "Siddhartha Gautama announces his arrival at the critical destination called nirvana and acquires the qualities of a mahasamana, a superascetic. Siddhartha, likening his ascetically charged body to a building describes the inconceivable and ineffable moment of becoming the Buddha. In that pairing of body and building, architecture is positioned for a portentous destiny in the Buddhist imagination. 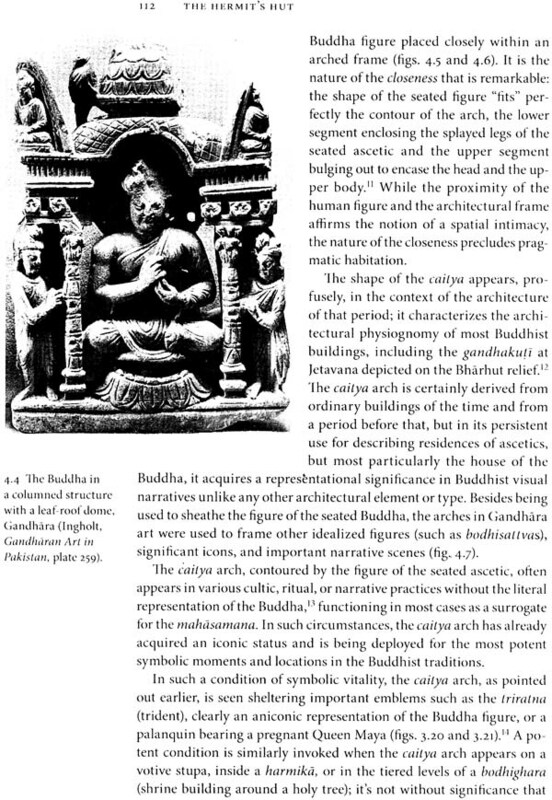 This is made evident when the Buddha provides a cataclysmic scenario for the momentous turn of the building body. The roof rafters are shattered, he announces, and "the roof is destroyed." The metaphor, while narrating the engineering of the ascetic body, is also evidence of the deeply imbricated significance of architecture in ascetic discourse and practices. The image of a building has already come to haunt the imagination of asceticism. Six years earlier, the Buddha then known as Siddhartha, had awakened in his magnificent palace in Kapilavastu and, like so many other before him motivated by a similar compulsion, stole out in the middle of the night, leaving home and family, the very core of dwelling. Thus ensues the operatic process of renunciation and asceticism. Searching for answers to burning existential questions and looking for liberation from suffering, Siddhartha wandered through forests and glades, living under trees or in basic shelter and visiting the asramas of sages and hermits. While the ascetic Siddhartha eventually found his climactic answer, as conveyed in the narrative of the destroyed house body and went on to propound a world turning philosophy and disciplined institution of monastic practices, he as well as his disciples and followers after him was vexed by the fundament that he began with, the matter of dwelling. After renouncing house and home, even the Buddha required some form of lodging. So did his followers. Dwelling for the Superascetic included living under a tree in a cave, or in a simple shelter. Each became the occasion for a continual debate and struggle in various ascetic circles on the nature of dwelling, its minimal requirements, and its implications in the life of an ascetic. Some of these deliberations, continuing for hundreds of dwelling, its minimal requirements, and its implication in the life of an ascetic. Some of these deliberations, continuing for hundreds of years after the Buddha, formed the core of ritual and regulatory texts for monks. Prescribed with an ideal life of wandering and alms collecting, the earliest group of Buddhist monks encountered the exigency of dwelling during the rainy seasons of northern India. The monks were urged to interrupt their wandering to take up temporary residence for the rainy period. The practice of taking temporary shelter from the rain led to the the formation of stable and permanent monasteries. Even the Buddha was thus assigned lodging and an address. Through be moved from city to city, teaching and preaching, he nonetheless stayed in particular compounds in each city and lived in a dedicated building. From what we know, such building were simple and unassuming compared with the elaborate houses in the city, but the house of the Buddha, known as the gandhakuti, or the fragrant hut, came to receive a focused attention from monks and laypeople and remains a source of didactic and philosophical reflection in Buddhist asceticism. It appears that the matter of dwelling, addressed as a house or hut, is a critical factor in the trajectory of the ascetic project. To put it another way, the narratives of asceticism are deeply etched by the profile of a hut. In the Mahayana story of Vimalakirti, a transformation of a mansion emblematizes the profound and subtle notions around "emptiness." 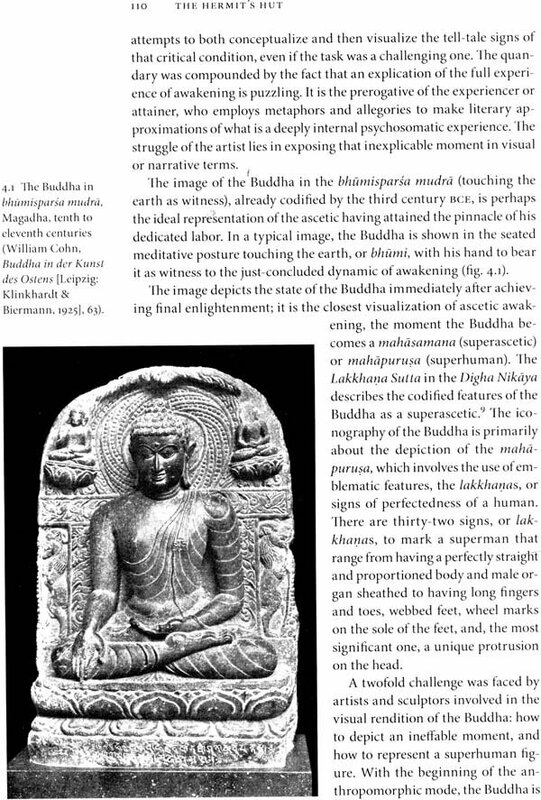 The story relates how the ascetically empowered merchant Vimalakirti, upon learning of the impending arrival of a large emissary from the Buddha to his grand house, divests it of everything, makes it empty so that it can hold multitudes. Vimalakirti is most likely an apocryphal figure, and so is the narrative of the transformation of the house, but in the Vimalakirti Nirdesa Sutra, the story of the magical mutation of the house from fullness to emptiness becomes a discourse on ascetic prerogatives and motivation. Littler was anticipated of how the story of a well to do man of the world transforming his mansion in the city to a plain, empty house might impact the fabrication of dwelling. Vimalakirti's emptied house is neither a hut nor a hovel, but it imbues all such structures with a resolute significance that belongs to a very particular human type the hermit, the ascetic, or the recluse. With the gandhakuti or Vimalakirti's emptied house, we are already deep in ascetic territory, where the hut comes to represent the inner nature of the practice. We can never know when the hut the dwelling comes into focus in the ascetic consciousness and becomes an object of intense deliberation and narrativization for the first time. Before it becomes codified in doctrines and practices and subsequently gets subsumed in the building of monasteries, the hut dwelling is part of an existential experience. Food and clothing are also two critical existential categories that define the parameters and practice of asceticism, but neither receives the wide range of discursive and conceptual treatment as the plain hut. The ascetic hut becomes critical because it is no mere object of reflection but a metonym of that reflection; the hut stands for how asceticism structures its intentions and practices. All these experiences began earlier in the historical and sometimes fabulous period when people left home and society for a journey into the disciplined world of asceticism. Buildings belonging to hermits and ascetics have existed on the horizon since the first human walked from home to reconfigure his relationship to the world and gain an understanding of himself. Since then, these simple structures huts, hovels, shacks, and other reductive forms – have played a critical yet paradoxical role in cultural imagination. While asceticism is understood as a practice of renunciation and reduction it also involves intrinsically an architectural project with immediate implications of spatial rootedness and material embellishment. In fact, the ascetic hut, despite an inherent image of plainness and reduction, is implicated in the development of grand and monumental architecture. The magisterial cathedrals of Gothic Europe, the exquisite temples and gardens of Buddhist Japan, and the elaborate Hindu temples of India have all evolved, in one way or another from a meditation on reductive dwellings. The minimal, ascetic hut seems to be rather intriguingly, a source for an amplified architecture. 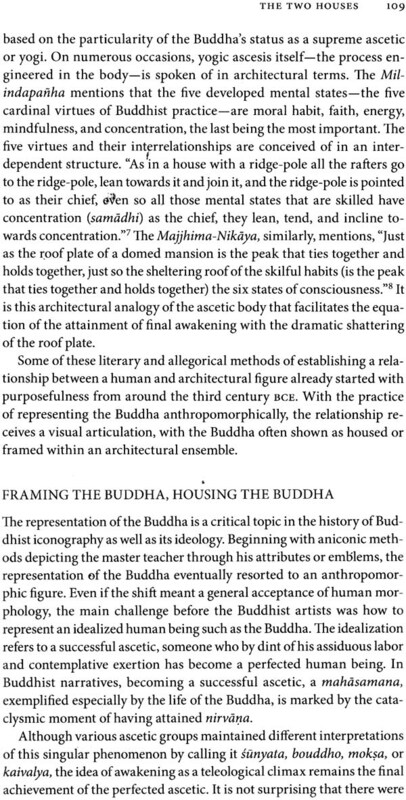 The following chapter investigate how a hut belonging to the ascetic structures the world of elaboration. 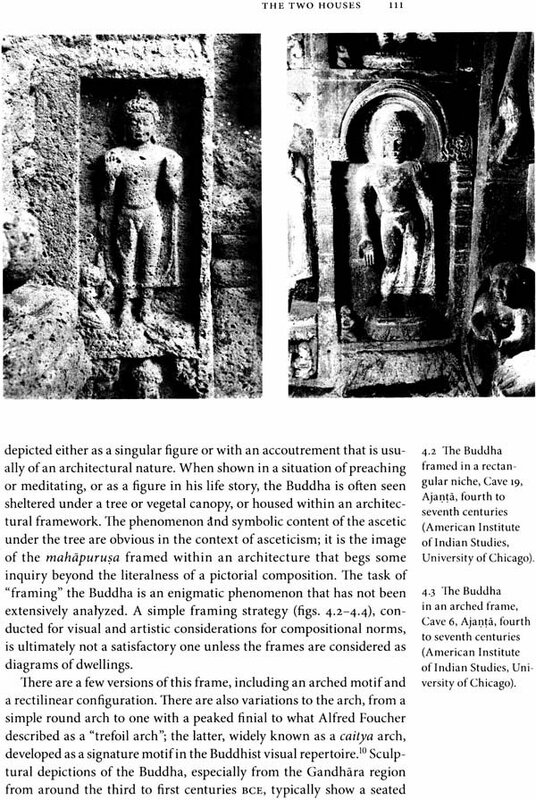 The geographical historical and phenomenological site of my study is ancient India and its traditions of asceticism, especially in the practices of Buddhism. With practices and ideological deliberations of asceticism centred on the hut, as noted, the structure remains as a repository of significances. However, in the historiography of Indian architecture, the ascetic hut has for the most part, vanished from the horizon: there is little discussion of possible originary connections between elaborate temples and this mundane, nondescript structure. Far less discussed is how that connection may have augmented venerated architectural ideas or anthropological paradigms. The lacuna seems troubling when there is sufficient evidence that a simple building such as the hut formed the morphology and symbolic contents of elaborate buildings. The disappearance of the hut also indicates that it has been absorbed in an increasingly refined architectural scheme or diffused in a world of ideas and imagination. With the presence of the hut confined to allusions and fragments in architectural, literary, and ritual repositories, the recovery of the plan and profile of that hut requires a process akin to an archaeological excavation.